As you know, I live in the Land of the Cheesesteak. I love cheesesteaks. You can hardly drive a mile in any direction in Philadelphia without passing a place where you can get a cheesesteak. Cheesesteaks are the bomb. 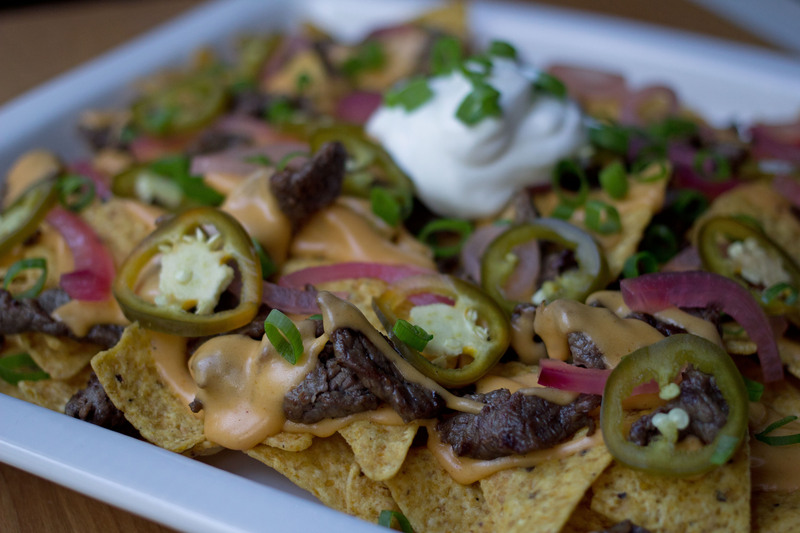 These nachos were inspired by my favorite neighborhood restaurant, The Blue Duck. 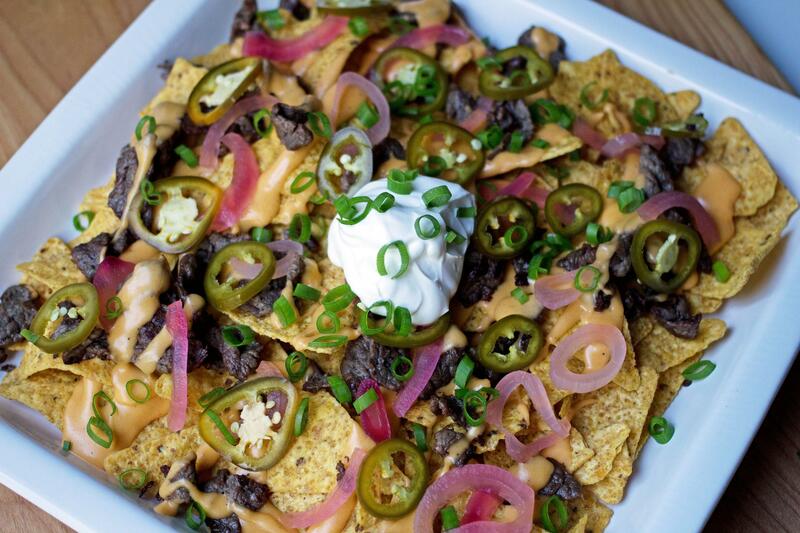 Back in March during March Madness, they posted a picture of one of their lunch specials on Instagram – it was a picture of these amazing looking nachos so of course you know I had to go. I commented and asked if they would be on special for dinner and they responded to me to “come on down” so come on down I did. When I got there I found out that the nachos were no longer on the specials menu, but they knew I was coming so they held on to some for me (insert flattered emoji here). And the nachos were just as good as they looked in the picture! 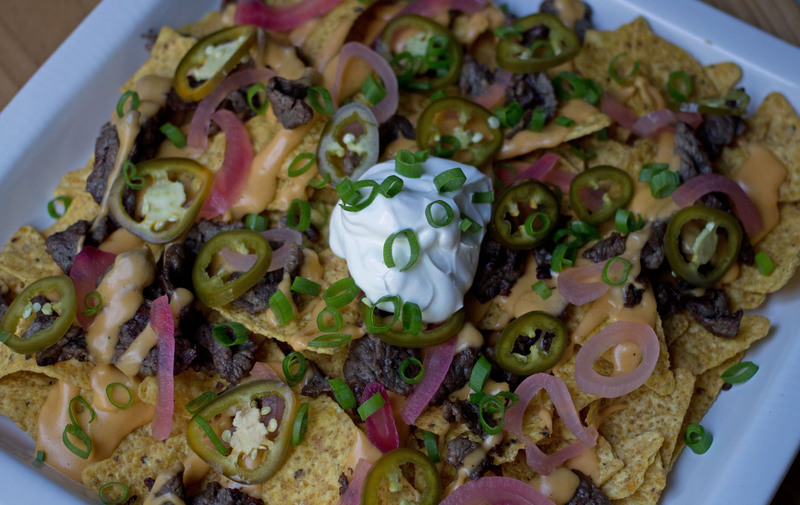 Complete with chopped steak (like cheesesteak meat), a cheddar cheese sauce, pickled red onions, pickled jalapenos, scallions, and sour cream… I mean how much more can a nacho connoisseur ask for. They were just friggin awesome. So I was inspired to make them myself. This has been on my mind for a while and I finally had the opportunity to make these this weekend. And they turned out way better than I expected! My only hurdle in recreating these was the beef. I had never made homemade cheesesteaks before – not beef ones anyway – but I knew all the good shops used thinly sliced ribeye in their cheesesteaks. So I went to the butcher at Whole Foods and told them what I was making and asked if they could slice some ribeye for me real thin. They actually recommended a different cut of beef (rump roast) and they sliced it thin by hand with a knife. I wasn’t sure how it would work out but I trust the butchers at Whole Foods so I went with it. Then I had to figure out how to cook it. I knew it would have to be over high heat to get a good sear and get some coloring so the beef didn’t look like that unappetizing grey-brown that beef can look when cooked. This method worked out really well for me. I already had a great pickled red onion recipe and pickled jalapeno recipe, so those components were complete too! And I basically just amped up the spice in my cheese sauce and I was set. So then I put it all together and was still unsure of the beef – I thought it might end up being chewy – but it was perfect. It was soft and tender, it wasn’t chewy, and it tasted just right with all the other components. 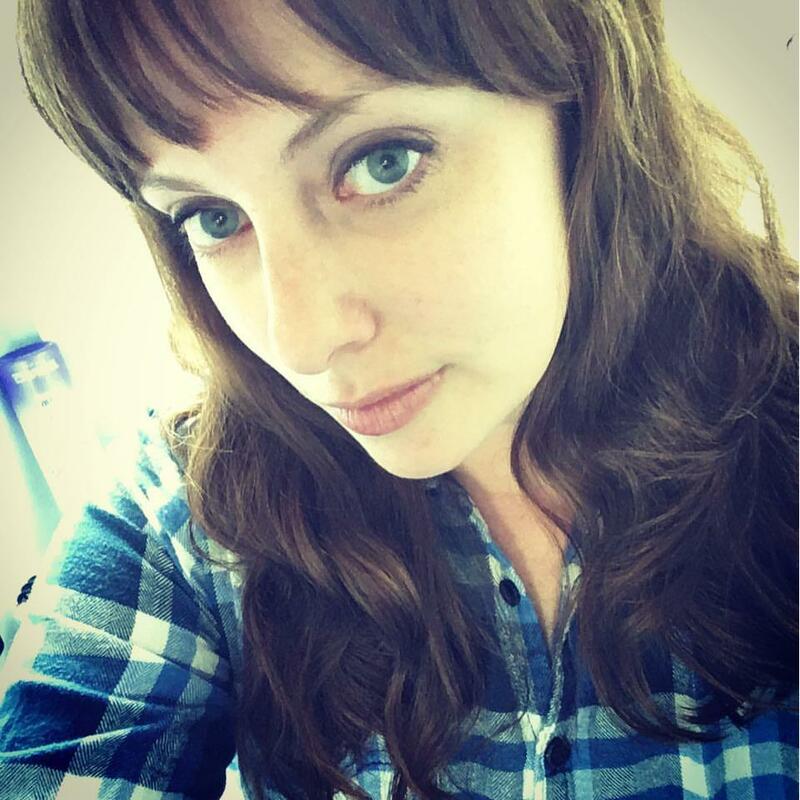 I had a choice – sit and eat, or do a victory dance. I chose to sit and eat! 1. Prepare pickled jalapenos and pickled red onions one day in advance according to recipe directions. 2. Prepare homemade cheese sauce according to recipe directions. Keep warm over low heat. 3. Trim sliced beef of large veins of fat. Discard the fat. Lay the strips of beef in a single layer on a cutting board, and slice crosswise into more bite-size pieces. Season with salt and pepper. Heat a large skillet over medium-high heat and add oil. When the skillet is hot, add the strips of beef. Do not move the beef; allow it to sear for about 2 minutes. Then stir it around so it browns on all sides. When the beef is finished browning, you may have a lot of fat in the skillet. If so, carefully pour almost all of the fat off. Then return the pan to the burner and continue to cook the beef. This second round of searing will get the beef nice and brown and caramelized. Continue to move the beef around the pan so it doesn’t burn or stick into one spot. When the beef looks nicely browned, turn the heat to low. 4. To build the nachos, layer tortilla chips on a large platter. Ladle on some of the cheese sauce, then add some of the beef. Then ladle on more cheese sauce, and add pickled red onions, pickled jalapenos, sour cream, and chopped scallions as desired. Serve warm and enjoy!